Well, I finally got around to trying the vegetable that everyone and their mother has tried .... spaghetti squash. I was skeptical about something that everyone loves so much - but just like avocado toast, they were right. Spaghetti squash is better than decent. It's pretty solid. I actually picked this miracle squash several weeks back during a Trader Joe's trip. Then it sat in the fridge and I kept looking at it. I made more pizza. I made ginger scallion meatballs. I made coconut pancakes. But, I hate food waste and the clock was ticking. So I found this great site called "Skinny Taste" that served me up several options for my spaghetti squash. I figured this option of a primavera was a great for a homey Sunday meal... and leftovers for Tuesday at the office. If you've ever been intimidated like me by trendy vegetables, just dive in. I'll be looking for more ways to use spaghetti squash. 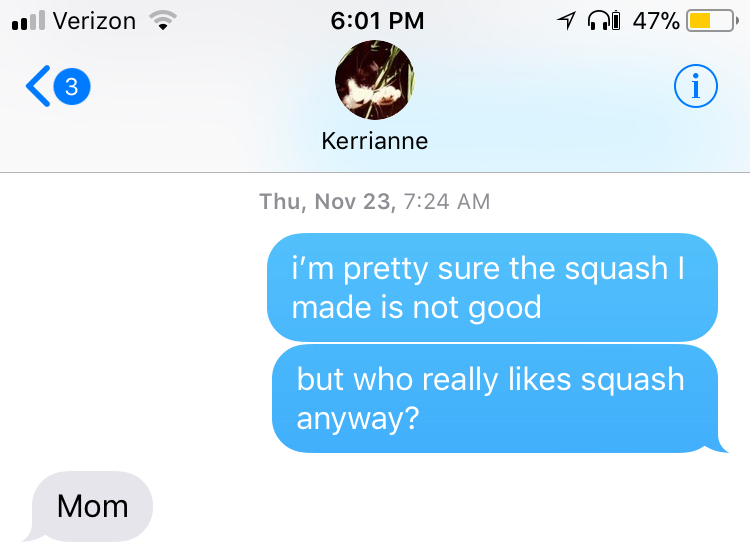 My mom is the only human I know who really loves squash so I'll try to serve this meal up again soon. It's perfect for leftovers and who doesn't love some slightly burnt cheese on the top? And for the record, I turned the afore mentioned bad squash into some delicious soup. Cut spaghetti squash in half lengthwise and scoop out seeds. Bake about 1 hour, or longer if needed on a baking sheet, cut side down. Once cooked, use a fork to scrape the strands out into a bowl. In a medium saute pan heat the oil over medium-low heat. Add the shallots, garlic, red onion, celery and carrots and cook 5 minutes, stirring. Add the broccoli and zucchini. Add the marinara sauce, increase heat to medium and simmer until the vegetables are tender crisp, about 3 to 4 minutes. Add 2 cups of the spaghetti squash and stir, adjust the salt and pepper to taste and cook 1 minute. Divide the vegetables in individual small casserole dishes - or one larger dish - and top with shredded cheese. Place under a broiler until the cheese melts ... then serve! When I'm looking at recipes, I oscillate between "fast but moderately impressive" and "long and slow". This recipe is a wonderful combination of both worlds. Yes, it takes 3 hours in the oven .... but it only takes like 15 minutes of hands-on time. A real winner in my book. I made this on a Saturday afternoon before heading out for a late afternoon walk. While it was simmering away in the oven, I enjoyed a lovely stroll, found some sea glass, scanned a family photo album, did a face mask, and took a shower. Real productive. Also, incredibly easy and you probably already have most of the ingredients. I first found this recipe a couple weeks back and it piqued my interest - but when I went to the grocery store for the meat.... I was stopped dead in my tracks. A pot roast was $24. I'm just one person and this was an experiment... so I needed to find a cheaper alternative. Googling in the store didn't give me a lot of comfort in the other roast options (rump, bottom, round, or whatever they were called) - but I did see some beef stew cuts of meat and grabbed that. This was $6 - so well worth the experiment. Meat // I think any cut of meat that can be cooked long and slow will be just fine. If pot roast was on sale, I would totally buy it - but beef stew cuts will be great too and perhaps easier for leftovers. SO EASY // I haven't had a recipe like this in a while. Essentially all the prep work is done in the blender and all the cooking happens in one dutch oven. Rice v Cauliflower Puree // I'm not on the Whole30 diet so I opted for rice as the base. I love making a good batch of rice on the weekends and slowly picking away at it during the week. Cauliflower puree doesn't exactly have that same allure and versatility. Spicy // The flavor profile of this meal absolutely has a kick to it. It's not spicy hot but just absolutely a punch. If you are serving to multiple flavor profiles, just cut back on the jalapeno and have extra lime. The lime is essential. In a medium Dutch oven, set over medium heat, add the oil. When hot, add the onion and sear on first side for 1 to 2 minutes, until browned. Flip pieces of onion over and cook on opposite side for an additional minute or so. Remove the onion from the pot and set aside. I had a hard time actually flipping the onion over because they began to break up - don't stress about it. Add more olive oil to the pot and turn the heat up to high. Sprinkle both sides of the meat with salt and pepper and place the meat in the pot. Brown on first side for about 5 minutes. Flip over and cook on the opposite side for an additional 5 minutes. If you are using stew meat like me, this won't be as precise but just try and brown the meat relatively evenly. Remove from the dutch oven from the heat and preheat the oven to 300 degrees F.
In a blender, add the cilantro, jalapeño, garlic, thyme, cumin, salt, coriander, paprika and 1/2 cup of beef broth. Pulse until very smooth. Add the remaining beef broth (2 3/4 cup) to the pot. Add 75% of your cilantro mixture to the pot. We'll use the other 25% for serving - so just save that to the side. Transfer the dutch oven to the oven and braise for 3 hours or so until the meat pulls apart easily. After about 3 hours I wanted my broth to reduce a bit more so I pulled the lid from the dutch oven, this also gave some of the meat pieces a nice little crust to them - which I liked. Plate the meat over white rice. Drizzle some of the extra cilantro sauce, chopped green onion and serve with a slice of lime. Another year, another Christmas card. I'm not sure how I managed to get the Christmas cards actually made and in the mail because every other aspect of Christmas was absolutely behind schedule. I was making and wrapping presents on Christmas Eve. I'm normally better than this. I think I managed to make the card in time because I could do it on the train. In the beginning of November, I started to go through all the pictures in my iPhone and tag the favorites. I have thousands of pictures in my phone so this is quite the retrospective on the year. I don't believe in resolutions - but I do believe in "intentions" and trying to set better practices. Going into 2018, I hope to actually get to yoga more, eat less salt, drink more water, and have more patience. I'm also trying to swear less. So far I'm doing well on the water but tanking on the swearing. Baby steps. My dad loves french onion soup. He's absolutely an onion guy. I am absolutely not an onion girl. I think it combines two of his favorite things: onions and cheese. So when I was in the kitchen and making this soup for my grandfather... and he asked me if I was making french onion soup.... I knew I had to make a batch for him. I've always heard that french onion soup was pretty easy. It has very few ingredients. As a result, it makes the actual cooking more important. Problems are not just solved by adding a spice or lemon juice, its about the fundamentals. Maybe. I don't know. less bread // original recipe called for a piece of toast on the bottom and top of the bowl. According to my dad, this was just too much bread. Just go for the top. croutons v bread // while we are on bread, I went with croutons instead of a single piece of toast. It was the same amount of bread but I like to think it made the soup easier to eat. more onion // when I asked for critical feedback, there was none.... but when I demanded it, he suggested more onion. This is absolutely a personal taste thing. If you like more onion, just reduce the stock to 4 cups. If you want more broth, go with the 6 cups. freezer safe! // always good to have a new soup that makes it through the freezer well. Slice & segment 3 pounds of onions. Crush and peel the garlic. You don't have to mince it; it will caramelize and turn soft and sweet as it cooks. Caramelize the garlic in the olive oil and butter. Pour in the onionsand stir around just until the onions are all coated in the olive oil/butter. Add in the thyme and the bay leaf and let the onions caramelize, about 20 minutes. Once the onions are caramelized and have cooked down, pour in the stock (about 4-6 cups) and beer. Simmer uncovered for between 1-3 hours. Cut your bread into small croutons. Roast in the oven with a bit of olive oil until lightly brown and toasty. Pull from the oven and sprinkle with kosher salt. Arrange your oven-safe individual serving bowls on a baking tray. Add the soup to the bowls and then make a single layer of croutons on the top. Cover the toasty croutons with lots of cheese. Make sure to use a melty one (e.g. gouda or mozzarella). I'm on day two of "snowstorm diet" which pretty much means "eat whatever I want" kind of but cook all the time. For lunch I had zucchini latkes over arugula. For dinner, we had prosciutto pizza with an arugula feta salad and tumeric sweet potatoes. This meal can also be called "the time I got my family eat tumeric". They will normally eat what I make largely because I don't tell them what it is until they take a bite. BUT - these pancakes! I had a little extra time for breakfast on this final snowday and wanted something beyond sourdough toast. This recipe came up pretty quick in my search and I jumped right in. These pancakes come together super fast, are super tasty, and a nice change. One of our favorite childhood dinners was pancake night. I'm not sure that 10 year old me would choose these but they are super flavorful. The sweetness from the blueberries and coconut is a real treat. After a mentally challenging week, I woke up today and just had an inclination that commuting would be terrible. So I decided to work from home. Between the frozen pipes on Sunday, Monday, and Tuesday ... then the blizzard on Thursday, I needed an easy relatively productive day. 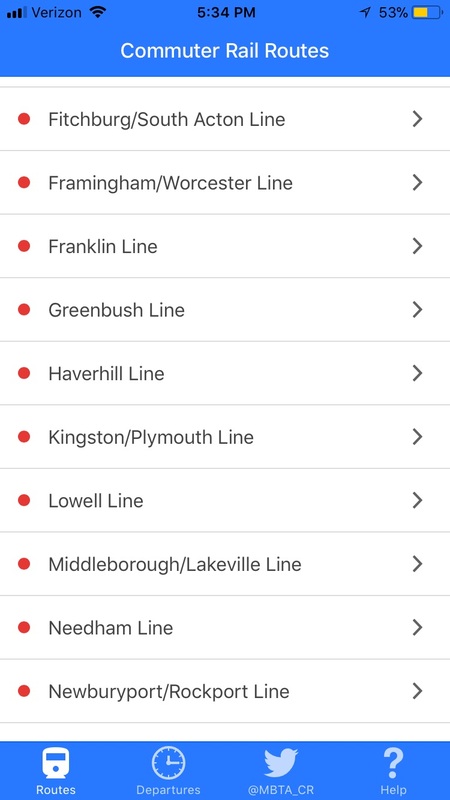 I had a feeling the trains would be bad. But they worked fine all day - until 5pm rolled around and everything collapsed. While part of my sympathizes with all those sad commuters, another part of me feels victorious for predicting it 13 hours earlier in my bed drinking morning coffee. But here's how to make these pancakes. Whisk all the ingredients (flour through coconut extract) together in a large bowl. Drop 1/4 cup worth of batter at a time onto a heated, buttery pan. After letting the pancake cook for about a minute, sprinkle with a bunch of blueberries and shredded coconut, pressing toppings in slightly. Flip after about a minute or so. Just use your normal pancake logic here. Serve with extra blueberries and maybe a little more coconut. Live a little. This recipe can be filed under "almost great, but absolutely good enough". I'm sure that isn't super convincing for others to try it - but I still think you should. I've literally been eating the leftovers for three days and I'm not upset. I found this recipe by trolling Food52 for recipes that called out "slow cooking". Sometimes I want a recipe that is pretty quick, but on New Years Eve I feel compelled to invest a couple hours in the activity. My plans for NYE are pretty low key. I think the last time I "raged" was in 2011. To be clear, there were about 6 people that came over but we drank a lot and made a delicious meal. In recent years, I've stuck with going to a yoga class and making a nice meal (2013 & 2017). I'm pretty happy with this tradition. actually make gratin potatoes // the top needs to be cheesier. I would try to do another layer of potato on the top and add extra cheese but especially one that gets melty. If I'm being honest, when I reheat this I put a little mozzarella on it. don't overcook it // We ended up eating dinner about 30 minutes later than I anticipated, so the meal dried out just a bit. I would recommend undercooking this next time and then tossing it under the broiled about 10 minutes before we are ready to eat. base layer // the recipe calls for salt/pepper on each pepper layer. I've been trying to cut back on my salt intake so this felt like a lot. I would try to add flavor in another way. I'm sure that cheese isn't the exact answer but it's a start :) So maybe add a sprinkle of cheese on each layer. As an fyi, this recipe actually makes a double batch of bolognese! So, its a real bonus leftovers situation and I love it. Here's how it goes. Add the chopped carrots, onions, celery and garlic to a medium-low dutch oven. Drizzle some olive oil in there too. Add ground meat and cook until brown. You'll have to break it up with the spatula or spoon. Add tomato paste and stir it in thoroughly. Cook for another 4-5 minutes or so. Add red wine. Scrape the bottom of the pot with a spatula to deglaze. Stir well, and cook for another 5 minutes. Add just enough water to cover the meat, toss in thyme sprigs and bay leaves. Add cumin and cloves. Bring the sauce to a boil and then reduce heat to very low. Simmer, uncovered, for at least 1-1/2 to 2 hrs, stirring occasionally, until sauce becomes thick, rich, and turns burgundy-brown in color. Cover peeled and sliced potatoes with cold water in a pan, bring to a boil and boil for 5 minutes. Drain potatoes immediately and rinse in cold running water to prevent further cooking. Grease a lasagna pan with butter on the bottom and sides. Put down the a layer of potatoes, overlapping if needed to cover the bottom completely. Sprinkle salt and fresh ground pepper over the potatoes. Pour down half of the Bolognese over the potatoes and spread evenly with the back of the ladle. Repeat steps 2-3-4, then 2-3 again. Prepare the custard mix by whisking the eggs and half-and-half in a bowl. Pour the custard mix over the pie evenly distributing it all over. Spread the bread crumbs and the cheese over the top. Bake Moussaka at 375F for about 50 minutes, or until the potatoes are cooked through (fork tender) and top is nicely browned. Let stand for 10 minutes out of the oven before serving. Every now and then I'll make a meal that is a complete knockout. THIS IS THAT MEAL. I had a feeling it was going to be good when I smelled the meatball mix. Then when the meatballs came out of the oven and I dipped one in the sauce? Home run. I was sitting on the couch eating and pronounced myself a culinary genius to my dad. He didn't disagree. I printed out this recipe from Smitten Kitchen probably a week ago. But it wasn't until the last day of my vacation that I finally got around to making it. Thankfully, I had already cleaned out the fridge, freezer, and the rest of my cabinets so I knew I only needed to pick up two ingredients to make this happen. I think I am ending this vacation with 8 bags of trash. It's embarrassing - and great. The meal itself is pretty easy to make. It comes down to three components: balls, rice, and sauce. Each on their own is pretty easy to handle and could be done several days in advance. I wasn't timing myself but I think I did this all in one hour. The key is just doing all the steps in an efficient order... and having a rice cooker. Combine turkey, scallions, cilantro, egg, sesame oil, and soy sauce in a bowl. The mixture will be very wet and loose. Add in panko flakes or bread crumbs until you get it to a slightly more stable shape. You need to be able to roll them into little balls. I think I added about 3/4 cup. Bake in a 375F for about 25 minutes. The time will vary based on how big you made your balls. While your meatballs are baking, you can make your sauce. Bring sugar and water to a boil in a small saucepan over medium-high heat, stirring until sugar melts completely. Reduce heat to a medium-low and add soy sauce, ginger, and coriander. Simmer, stirring occasionally, until reduced by half, about 20 minutes. Use a rice cooker. End of story. Combine the rice with a shredded carrot.